It’s nice to see our pickups in the academe. 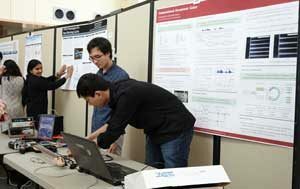 Chengxiang Ren and Jeffrey Huang, Cornell University, Electrical and Computer Engineering, used the Cycfi Neo (now Nu) polyphonic pickups in their Master’s project. I’ll try to learn more about this project and these cool people. Their ideas are perfectly aligned with mine. 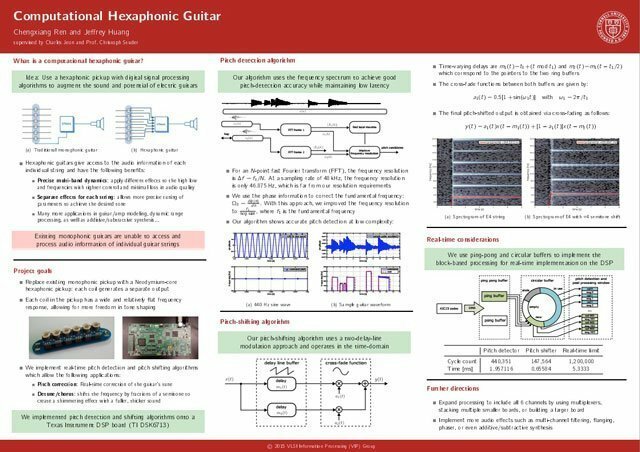 In this project, we designed a computational guitar that consists of a hexaphonic pickup and a digital signal processor (DSP). As an example application, we implemented a pitch correction algorithm that corrects the pitch of each string in real-time, which enables us to play the guitar “in-tune” when it is not. Our pitch correction algorithm operates in real time on a Texas Instrument DSP board (TI DSK6713) and combines frequency-domain pitch detection and time-domain pitch shifting. Here’s the poster. Click to see the actual PDF (they won Second Place Overall in the Poster competition).